I majored in Art with Design and Crafts focus at Cal State LA, graduating in 1971 with minimal interest in clay. Several years later, I reconnected with Joe Soldate - my retired college ceramics professor. Taking a class with Joe at Creative Arts Group in Sierra Madre, I found my drive for ceramics. I realized that I didn't have to make a lot of pottery ware that most anybody could make better than I could. Wheel thrown ceramics tend to be very similar (yeah, round!). So using both hand building and wheel throwing I began to explore the teapot form. I appreciate utility -- because, what does one do with a non-functional sculpture? One lets it get dusty. So I make teapots that are useable sculpture! There are so many ideas that come to me, I don't have time to experiment with them all… I do like to tease, to pull on your assumptions. So sometimes I like you to think, "That's a teapot?!" During these tough political times, our nation is experiencing constant aggression and violence against people of color. We are exposed to it on a daily basis in all branches of the media. We have become a society that fears those that look and think differently than us. It is a common reaction to fear what we do not know. BUT in order to lose that ‘fear’ or sense of ‘other’ we first must break down the barriers that divide and continue to separate us. Inspiration for this group show came from the idea to present different glimpses or flashes of people’s experiences. How can we truly grow and empathize with other people when we continues to surround ourselves daily in same places and with the same people? Our own personal experiences vary so much that it makes us appear to be extremely different from each other. Nevertheless, we have more things in common than we may acknowledge. Culture/race/heritage are sensitive words and topics. I believe it is important to understand as much as we can about our own personal histories and origins in order to cultivate an appreciation of all those that came before us. Moving forward tends to be easier when we know where we are coming from. Verbal interactions between us are also significant. Perhaps we have forgotten how to speak to each other with respect and humility. Even so, sharing our stories with strangers or conversing about narratives passed down from generation to generation have been some of the most beautiful tales I have ever heard. Included in this show are snapshots, flickers of moments and places from the narrative of these artists’ lives. I hope you find them interesting, curious, and inviting. Xiem Gallery is delighted to present Many Hands Make Light Work - an exhibition of ceramic Table Lamps, produced in an amazing collaboration between Xiem Students, Instructors and Members. Xiem Member, photographer and art director Adi Mizrahi devised and presented a Table Lamp class at Xiem at the end of 2017. Working with Intermediate level Hand Building students – most of whom had taken several classes with Titia Estes, he and partner Ron Hellmann facilitated the design, construction and wiring of a variety of unique hand made ceramic lamps. The students' lamps were so successful that we decided to show them in the Gallery - together with lamps produced by other Xiem members inspired by the project, plus a few made by Adi and Ron for their exciting new design company, Mizrahi-Hellman Ceramics. Enjoy! Joe Soldate passed away in 2014, but Soldate 60 - the clay body he developed for his CalState LA students to use in the 1960’s continues to grow in popularity - an enduring tribute to the practical ingenuity of this extraordinary artist. Produced by both Laguna Clay and Aardvark Clay Supplies, Soldate 60 is still the go-to stoneware clay for beginners and established artists in SoCal schools and studios and beyond. Following a lengthy and illustrious teaching career, Joe joined Xiem Clay Center in 2006. A benign and inspiring presence in the studio for several years, he was sorely missed when he became too ill to continue. While the clay body he developed remains a vital part of the conversation for so many ceramic artists, sharing the origins of Soldate 60 with the community has become increasingly difficult. For despite his stellar reputation, researching the usual internet channels to find out more about Joe Soldate proves frustrating. Those who knew him well may speculate as to whether this was intentional: Joe was primarily a conceptual artist, who didn’t much care about promoting or even documenting his work. He delighted in impermanence and consequently many of his pieces were left unfired - built to disintegrate. Or perhaps he was simply modest. Be that as it may, his work and his world-view were revolutionary. And this exhibition is an attempt to refocus the narrative. In collaboration with Christine Soldate and Joan Aebi, Xiem Gallery is gathering a small selection of Joe’s work and placing it and his clay in the context of work produced by some of his former students, his contemporaries and a new generation of clay artists who know little about Joe, though they know Soldate 60 really well. By turning this spotlight onto Joe and his joie de vivre, we hope to illuminate his life and legacy for the Xiem community and a wider audience. Enjoy! Joe Soldate - in conversation. I was born in Blythe, CA: 5/12/37. A year out of high school I bought my first long board. Surfing and hotrods had magic for me in the 1950’s. We’d talk of “firing up one of those suckers!” on Friday nights. And we surfed at Stanleys, at Malibu, down south. On a surfboard there is a sensation of a growing pressure that blooms into a wave. And you’d feel a pressure growing in the middle of your chest, knowing you were hooked, on. Then came that moment of amazing energy - when you knew you could do this. I used to giggle a lot. Still do. Water – it can be hard as ice, and then it melts. Using kilns is a marker of time. Stoking of kilns goes back 3,000 years. My first ceramic experience was unloading kilns at a brick yard. I was 14. Later I took some pottery classes at Chaffey College. When you are firing a kiln, you exercise control – like a king or a god. It’s a reactionary situation. I had no desire to stoke kilns. In 1986 I built a straw-bound chair to set on fire. Burning Chair was an installation and performance at Sun Valley Center for the Arts, in Idaho. I am more interested in process than conclusion. I enjoy remnants. Sometimes I use clay in my work. I often use time. I like the pressure and rhythm of time-based events. Errosion/Process 1974 – 76 at UC Irvine and Mount San Antonio was a series of unfired clay and lath installations referencing architecture. They disintegrated in the gallery. Show over. Sweep it up. I like the unpredictable, the chase. I make a quiet zone, even when I’m surrounded by many people. In my teaching I tried to open things up - let’s see what happens. Once I got my students to glaze rocks. Ceramics unites the constraints of limitation with the freedom of experimentation. Ceramics Lab - presented for Art Center College of Design at Xiem Clay Center by Heather Rosenman, introduced students to the use of the medium for creative expression. Students were required to make a commitment to both practice and investigative experimentation. This show shares some of their results. Xiem Gallery’s seasonal selections reflect the creative diversity of ceramic art produced by Xiem studio members, instructors and local artists. Complementing the brilliant color of large coil-built Raku bowls by Biliana Popova and the radical texture of Lizard Skin plates and bowls by Pat Husted are a selection of small-scale abstract and figurative ceramic sculptures by Beverly Archer, Carol Ann Klimek and Melinda Karl Forster. Also on show are new pieces from Ginko Lee, Heather Rosenman, Heidi Mollenhauer, Lourdes Jimenez, Steve Horn and Titia Estes. Xiem Gallery selections reflect the diversity of ceramic art produced by Xiem studio members, instructors and local artists. An installation of 1,024 test tiles, archiving the richness of possibility inherent in creative combinations of Xiem‘s 32 Cone10 studio glazes; as explored by Jose Salinas’ Glaze Application class. Cameras and notebooks welcome! Our seasonal gallery selections reflect the diversity of ceramic art produced by Xiem Studio Members, Instructors and local artists. Visit Xiem Gallery to view our winter collection. Our seasonal selections showcase ceramic art produced by Xiem Studio members and local Artists. WHERE: Xiem Gallery Please note our Holiday Hours. 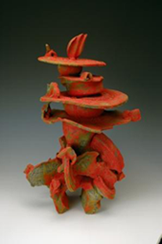 Xiem Gallery’s seasonal selections showcase ceramic art produced by Xiem Studio members and local Artists. Prominently featured in our Spring Collection is Byproducts – a herd of cows by Beverly Archer , and fresh new works reflecting the change of season from a number of Xiem Artists. We are delighted to present our Fall Selection of work by exceptional local artists. Many of the artists are associated with Xiem Studio - either as members or instructors. We are especially pleased to be showing new pieces by Junzo Mori, our renowned studio technician. To celebrate our 10th anniversary, we are delighted to present a selection of recent figurative sculpture and wall pieces by some of the exceptional artists who have had one-person shows in Xiem Gallery since we opened in 2003. EXHIBITION: Ten Great Years at Xiem! Curated by Stephen L.Horn and referencing Fire and Water, Pasadena Arts Council’s AxS 2011 festival, Xiem Gallery presents an exhibition exploring the theme of ceramic artists who surf. 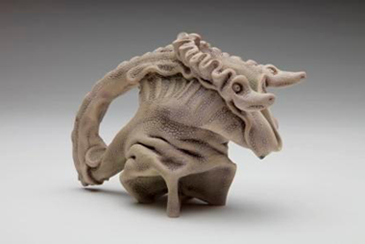 In celebration of the richness of the local ceramic art scene, Xiem Gallery invited renowned Pasadena ceramic artist and educator Stephen Horn to curate our AxS 2011 festival show. In response to the festival theme “Fire and Water”, Steve came up with the evocative title Stoked! referencing the parallel universe of what he terms the “tribe” of ceramic artists who surf. Steve’s take on the festival theme is quirky yet exquisitely pertinent to a local festival - while kilns and the stoking thereof are areas of common experience for potters worldwide, the dual pursuit of forces of fire and water as defining elements of personal expression, appears to be unique to California clay. A life-long surfer and ceramic artist, curator Steve Horn will present his own work in the company of works by a group of eminent ceramic artists who surf. The exhibition promises to reveal fascinating correspondences in the passionate commitment to form, play, courage, balance and open-ended exploration germane to both disciplines. Stephen L. Horn received an M.A. in art from California State University, Fullerton, in 1975, and an M.F.A. from that same institution in 1996. Since the late 1960s, he has worked his own studio and taught ceramics at several colleges in Southern California, including Riverside Community College, where he is currently a full professor of art and chair of the art department. Steve also served as an arts commissioner for the City of Pasadena.